If you have any questions about the Jutson Exploration HeliCat information page below please contact us. 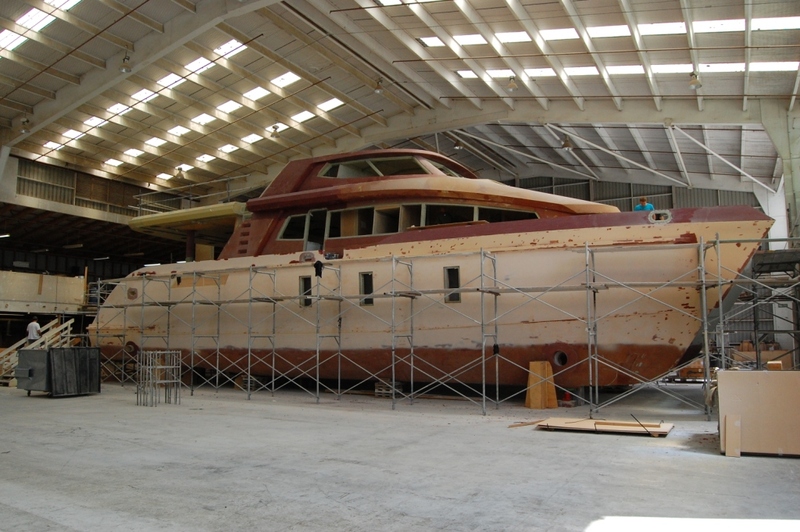 With launch in 2014, the lovely 24m Jutson Exploration HeliCat motor yacht is a highly innovative catamaran, built by the New Zealand shipyard Pachoud Motoryachts. 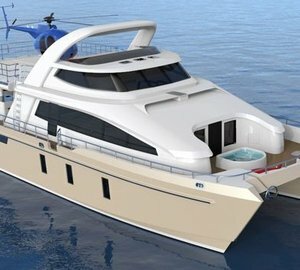 Beautifully designed by Scott Jutson, the 24m Jutson Long Range Cruising yacht boasts an amazing helicopter deck, fitted with a sliding landing pad for maximum clearance, when landing, as well as a 500g refueling facility. In addition to the helicopter deck, the 24m Jutson Exploration HeliCat superyacht features a custom landing craft tender that transports 2 Honda 230 motorbikes, which are handled with a dedicated crane system, discreetly built in to the aft deck overhead. Moreover, there are two Hobie Triaks, stored in the transom face locker and easily launched with the hydraulic tender platform. Accommodation aboard the 24m Jutson Long Range Cruising yacht is divided into 4 luxurious cabins, including a master cabin on the main deck, as well as three additional guest cabins and one crew cabin below. Run by twin MAN R6 800 diesel engines, the 24m Jutson Exploration HeliCat luxury yacht can reach a top speed of 20 knots and a cruising speed of 12 knots. Made of epoxy composite, she boasts a high level of autonomy, with a range in excess of 2500 NM. The superb 24m Jutson Exploration HeliCat yacht can comfortably accommodate her guests in 4 lovely and elegant cabins. These include a master cabin on the main deck, as well as three additional guest cabins and one crew cabin below. The 24m Jutson Exploration HeliCat yacht features an amazing helicopter deck, as well as a custom landing craft tender, that transports 2 Honda 230 motorbikes, and two Hobie Triaks. The luxury yacht Jutson Exploration HeliCat displayed on this page is merely informational and she is not necessarily available for yacht charter or for sale, nor is she represented or marketed in anyway by CharterWorld. This web page and the superyacht information contained herein is not contractual. All yacht specifications and informations are displayed in good faith but CharterWorld does not warrant or assume any legal liability or responsibility for the current accuracy, completeness, validity, or usefulness of any superyacht information and/or images displayed. All boat information is subject to change without prior notice and may not be current.